As you read this post I will be enjoying the delights of Paris. 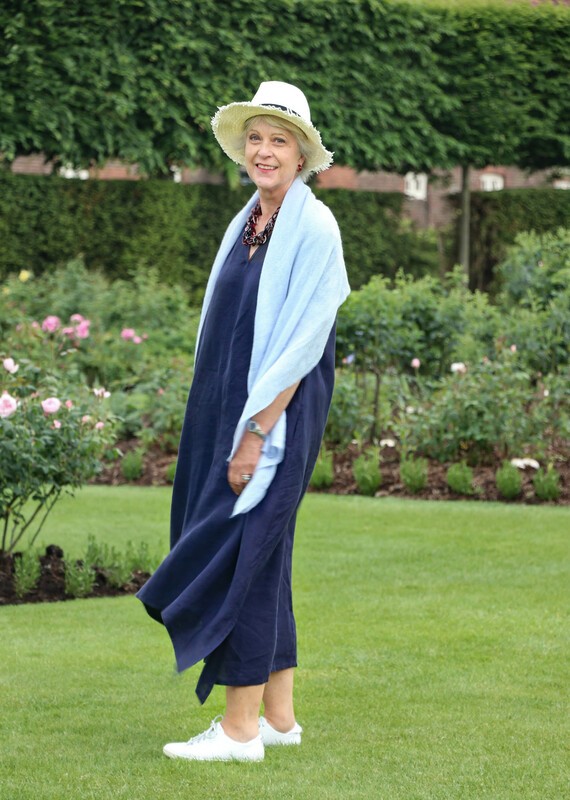 If the weather is as predicted I shall be wearing my new navy handkerchief maxi dress from John Lewis. It formed part of my Paris Capsule wardrobe. It is linen and yes it does crease. I know that linen divides opinion. You either love or hate it. I am in the love camp. So let’s take a minute to discuss the properties of linen. In high temperatures, it is one of the coolest fabrics you can wear. I keep several linen outfits in our apartment in the South of France ready for the hot and humid months of July and August. There are some great linen dresses for sale in the local markets and many chic French women buy and wear them with confidence and an air of Je ne sais quoi. Yes, linen creases. If you are going to wear linen this is something you will need to embrace. I give mine a quick press after washing and then relax and enjoy its natural qualities. 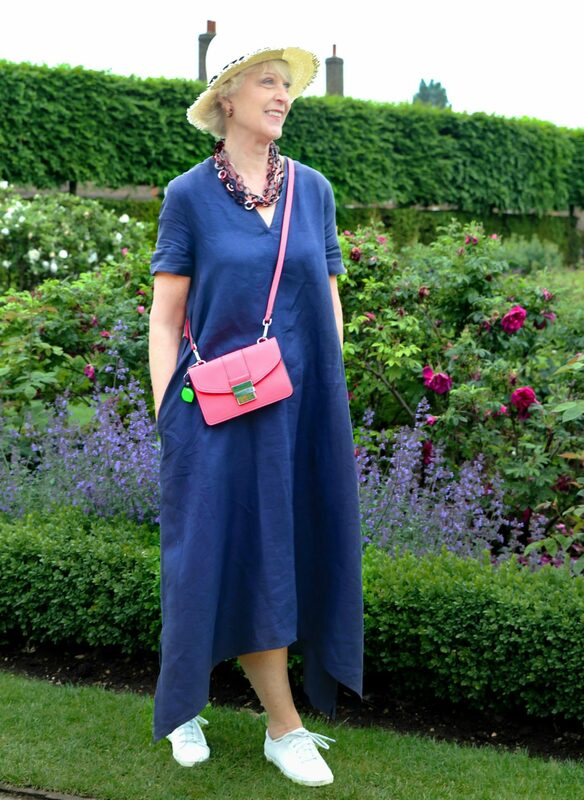 A simple linen dress is a wonderful blank canvas on which you can paint your own picture with the aid of accessories. Here I have added a pale blue light wool shawl, frayed edge straw hat and chain bead necklace. I have had my hat for several years (similar) and purchased my scarf and necklace in St.Tropez market. My basket is also from St.Tropez market. Wicker baskets are very popular this year so there are plenty available in the shops at the moment. Do you accept and embrace the properties of linen or is it not your cup of tea? The photographs were taken in the gardens of Hampton Court Palace by Laura Hines, follow her on Instagram. You will look chic in Pari! I love linen, wrinkles and all. I live in the southern US and nothing beats linen and/or cotton for our hot humid weather. Thumbs up! You look lovely Josephine. I agree: love a plain linen dress. The possibilities are endless. I have two that have been in my closet for over ten years, and I sitll reach for them, in black and red. I love linen, for both myself and my husband. I have a favorite black linen dress – kind of a fit and flare style – purchased over 20 years ago at Gap that I wear year after year, redying periodically to refresh when the color fades. I hope it lasts forever! Gap used to make some great summer dresses I still have a couple. Sadly recently they do not seem to be using the same quality fabric. Looking lovely as usual Josephine. 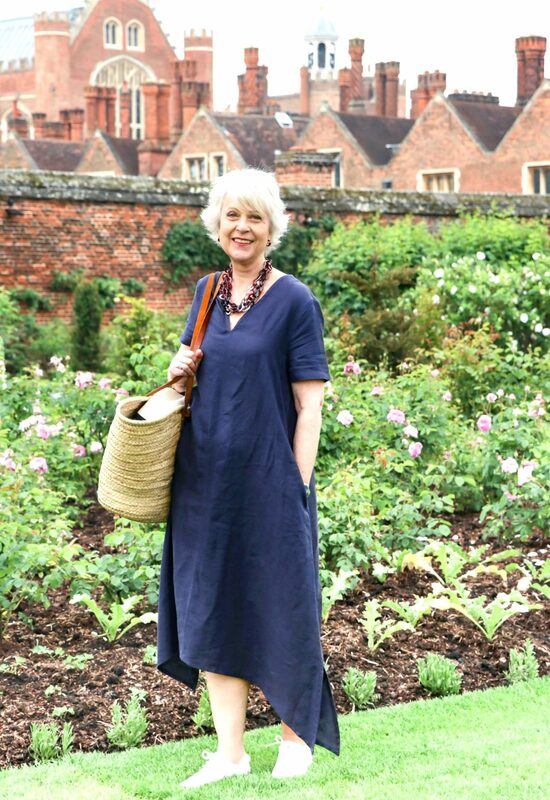 Unfortunately, I rarely (have occasion or the right weather to) wear dresses but I am very fond of my linen trousers – once broken in and no longer scratchy. However, as it’s not the most robust material, I tend to wear them out quite quickly so I am always looking for new ones! I love linen creases and all! Sorry, I dislike “pure” linen. Recall the time I spent a fortune on some from Ireland. Felt really untidy every time I wore the garments. Expensive lesson! Must say I like your outfit, Josephine, apart from the shoes!! I now tend to buy a garment with a percentage of linen : works for me. I agree Mary A percentage of linen in a garment an often be the answer. I agree with Mary on two counts. I am more comfortable with a linen blend. Also, I don’t own a pair of tennis type shoes. There are so many nice looking and very comfortable walking shoes by Dansko, Clark’s and many more. I just spent two weeks walking on uneven rocks and cobblestones on the Amalfi Coast wearing a very nice looking pair of Dansko sandals. I have walked all over Europe and part of Asia very comfortably in Dansko and Clark sandals and flats. I agree linen blends are excellent you get the quality of linen often without the hassle. I have tried Clarks shoes and I did not find them very comfortable also as I have small feet in relation to my height they looked a bit clumpy. I will shortly be trying out some Van Dal Shoes so will report back. Don’t know Dansko will check them out. I am a linen lover as well. You cannot beat it when it’s hot and I don’t mind the creases. I have had linen pants, shirts and dresses for years. Me too! Love that navy, Josephine. I am in Majorca at the moment with my trusty white trousers and long shirt, and beige shorts bought from Vivi-direct years ago and always first in my case when packing for a warm weather holiday. I agree MaureenC If possible buy the heavier weave linen it will wash better and last longer. I like linen quite a lot, although as another reader says — linen comes in a variety of qualities and combinations with other threads. Then there’s the great viscose/linen long blazer I bought for $5 at Good Will earlier this year. I think I’m down to about 25 cents per wear. I agree Ann quality of linen does very. It is better if possible to spend a bit more money and purchase the thicker variety. Some of the thinner versions don’t always look too get when they crease and they don’t last. I love your philosophy thanks for sharing. I notice that French women in the South often wear sleeveless linen with confidence. They generally seem to be accepting of their ageing bodies. No linen is not for me, I am a very tidy person and linen is not tidy. I do not even like it on other people sorry. No need to be sorry everybody has their own preferences. I’m not a fan of linen either but I did once have a printed linen skirt which I made myself and lined/backed in fine cotton. This gave it some body and the pattern disguised the creases. It was a remnant of a very expensive fabric however. 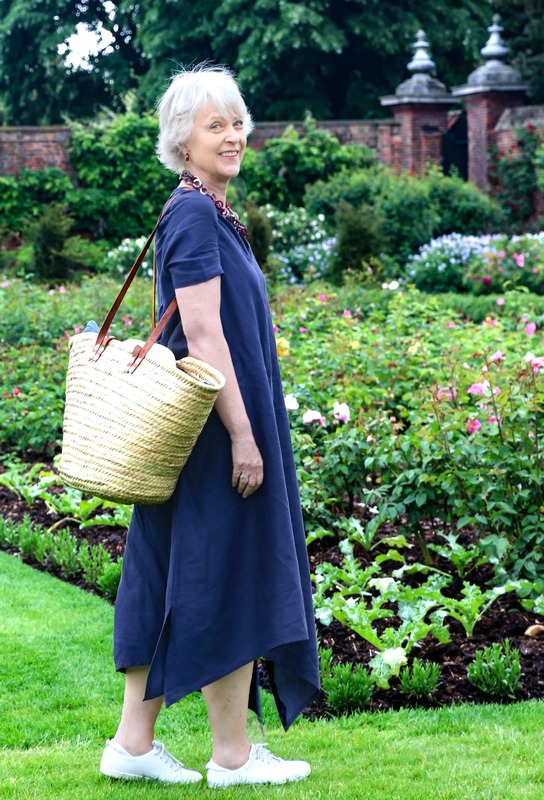 Most of what is sold as linen or linen mix is thin, floppy and looks like a rag in minutes – not for me! Recent holiday very hot – + 32 degrees and very humid. I think quality cotton jersey, crinkle cotton/viscose are good options and if only you could get pure cotton seersucker now, cool and smart! I actually find linen (the thicker variety) to be a bit too warm on truly hot days. I wore linen in Paris last June in 33˚C temperatures, and had to take it off. Wrinkles in linen (good linen) are only important if the garment is one that is expected to look pristine. Otherwise, life is too short to worry about wrinkles if your purpose is to stay cool. In fact, though, I wear linen in medium-hot temperatures. I have had all kinds of weights of linen; having grown up in sweltering and humid Hong Kong, I can attest that handkerchief-weight linen is best in that temperature zone. Thicker linens hold up better in the long run, but come with their own problems. I am inspired by your dress to find myself a linen maxi, though! I think it depends on the style. If the item is loose enough I think most weights of linen work. I don’t like any restricting garments in very hot weather.